I placed 3 cups of cashew nuts on a sheet pan and toasted them in an oven set to 350F until they browned slightly. Let this cool, then chop coarsely and toss with a tablespoon of flour to coat the nuts and prevent them from sinking/getting soggy in the cake. Next, I creamed 3/4 cup of unsalted butter together with 2 cups of sugar until light and fluffy. Add three eggs, one at a time, until well blended. In another bowl prepare and mix 3 and 1/2 cups all-purpose flour, 1/2 teaspoon salt and 1.5 teaspoons baking soda. Mash up 8 large bananas, to make roughly 2.5 to 2.75 cups of mashed banana. Mix in some vanilla paste or extract into the bananas. Measure out 1/3 cup of milk and add 1 tsp. of white vinegar (not datu puti, but clear distilled vinegar or kalamansi if you don’t have the vinegar). Back to the butter, sugar and eggs whirling about. Add half of the dry ingredients, then half of the milk, then the dry then the milk. Add the banana mash and mix. Add the nuts. Add a cup of chopped dried mango (cut these relatively small). And pour into prepared pans… I had enough for 7 mini foil pans. Bake for 35-40 minutes or so in a 350F oven. Let it cool a bit and dig in. Not bad at all for a “use what you find” cake. The dried mango was a brilliant addition, pieces softened yet were still distinctly mango flavored and sweetish/tart. The cashew nuts were not the greatest, I think pecans or walnuts would do better, but at least this was pretty local, oh and maybe caramelized pili nuts would be interesting as well. And the bananas really shone through, despite the other flavor distractions. This was a bit too sweet for me, so cut the sugar a bit if you like. Otherwise, a very decent version of a banana cake with stuff added… perfect with a hot cup of tea. hi marketman! long time lurker, occasional commenter here :) i was just curious- what does the vinegar do for the recipe? Your keyks look really nice, MM! When making keyks, have you tried separating the whites from the yolks, beating the former until stiff, then adding the whites to the batter at the end? The end results seem to be a fluffier cake. mmm, dried mangoes in cake. that’s what they put in my favorite mango bar, red ribbon has it. it’s like butterscotch with just dried mango bits. about the word cake. masyado naman mahabang sabihin ang “matamis na kakanin na yari sa arina.” arina, is also a borrowed word. maybe the reason why we don’t have the indigenous term for it was because wheat (therefore also the wheat flour used for making breads and cakes)was not originally part of our ninuno’s diet. wala silang cake at tinapay (uy, hindi ba indigenous ang salitang tinapay?)noon. the closest term we have is puto, which is also a generic term (at least here in laguna) for all rice or local-carbohydrate-based kakanin, like bibingkang casava or nilupak na saging. even the term kakanin would tell you what its basically made of – kanin. i remember in a lecture way back in college that the filipino language is not a fully developed language which can be used in all areas of learning, especially the math and sciences, unlike the english, chinese, and japanese language. so these subjects were conducted in english. we tried Filipinizing the courses in natural science (i guess we were the first batch to be taught in filipino, at sorry po, di ko na maalala kung ano ang tawag sa natsci sa filipino), by using local terms some in visaya, tagalog, and bicol. the point was to follow the mandate of using the national language as the medium of instruction. and we all knew what happened. we’re proficient in neither language. ay, paumanhin po, nabanggit ko po ba na mukhang katakam-takam ang “matamis na kakaning yari sa arina, atbp…” na gawa ninyo? maganda ang pagkakatagpi ng kulay ng binilad na mangga, tinadtad na buto ng kasuy, at nilamas na saging? pihado ko, malinamnam din yan. I believe the word â€œkakaâ€ has its own cognizant meaning in each culture in the universe and I will not visit that subject matter no no and my sincere apology to you. With your glorious and innovative banana mango cashew cake which sum up to me is the taste Manila. Last Holiday, a friend gave me a bag of polvoron with dried mangoes in it and walnut. They are delicious. MM, I’m just starting to bake and has attended several baking lessons in front of Q.I. Will definitely try this one today. Keyk o kik.. pareho lang gihapon. Lami kan-on. Dili kinahanglan i-tagalog pa. Bisan nakasuroy na ug New York, Washington, Hongkong, Seoul ug Manila… Bisaya lang gihapon. And no eight years of panitikan will ever change that. Or the affinity for leche flan, Alavar bagoong and mangga and lechon ala Marketman. Hanga ako sa iyo Chris! Saludo general!!!! Napakalalim naman ng iyong salitang Tagalog…kasing lalim ng balon!!! Pati na sa iyo andykamatis!!! Saludo din ako sa iyo!!!! mina, I didn’t have buttermilk, so instead, I used whole milk with a touch of vinegar to substitute for the buttermilk. hahaha…Keyk or kik (binisaya)..you make me laugh MM. Anyway, if you still have some cashew leftover, make some puree and have a cashew butter and jelly sandwich ala bouchon bakery. TK serves this “CBJ” on brioche….sarap!! Your base cake is basically banana cake. The over ripe bananas are the best. I have a recipe where I’ve experimented on the nuts that best go into that. The walnuts(tho more expensive) survive best and really are so good with that cake.Cashew have a tendency to soften up. Your mango bits look and sounds great. (want to try that!!) As I was looking at your recipe,it’s the basic banana cake recipe but without the vinegarand milk. I have a recipe where (aside from banana) I include grated carrots,walnuts and bits of pecan. Aside from the cutchinta of bettyq,I gave a lot of this out and friends always ask for more. I was given the original recipe twenty years ago and as bettyq says we can tweak and add a little something to make it “different”. The overripe bananas are the best!! (really moist)I lessen sugar so you can eat lots and never get tired of it.I do the basic banana cake,then fold in the walnuts (broken by hand) and fold in the grated carrots.Decor top with whole walnut and/or pecan. So good and moist. Nakakatuwa MM ang mga ekperimento ninyo. Tunay na marami kayong natutulungan. Mula nang pinakilala ako sa “site” na ito,lalo akong naganahan mageksperimento at intindihin ang paghuhurno at pagluluto.Masayang linggo sa ating lahat!! Dagdag po. Isang beses,dahil sa pagkain namin ng keyk ko,napagusapan naming magkaupisina– bakit di ginagamit ng mabuti ang pili(dahil sinabi kong ilang klaseng “nut” na ang ginamit ko na magandang kombinasyon sa banana keyk. Napagusapan namin bakit sa Thailand,talaga pong maraming klaseng sampalok ang iyong matatagpuan. Halos pareho ang klima natin para makaangkat ng maraming sampalok,ngunit,talaga pong naunahan tayo ng thailand sa pag gawa ng iba’t ibang uri ng kinending sampalok-maanghan,malagkit,tuyot,maliit na parang bala (bullet) at marami pang iba. Napag-isipan ko na sana,mayroong prutas na maaaring gawing talagang alam nilang Pinoy–katulad ng ginawa ng Thailand sa sampalok. Nawa sa pageeksperimento ninyo MM,mayroon tayong matagpuang prutas na kapag sinabi iyon—alam ng mundong tunay na Pinoy ito…. (katulad ng paanong napalago ng Thailand ang sampalok. my late lolo used to call all desserts “panghimagas” – be it minatamis na garbanzos, slices of fruits or even cake. i never really thought about the english to pinoy equivalent of CAKE. i do know bread is “tinapay”, native desserts are mostly “kakanin”, most rice cakes are “suman” something, but cake is a mystery. 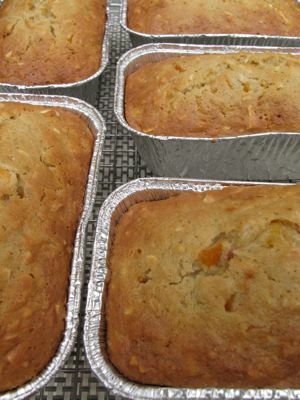 on dried mangoes in banana cake, i’ve also experimented with it, but i prefer that dried mangoes to be re-hydrated first by simmering it in a little water until tender, so that it is silky and blends in the batter. the direct chopped dried mango in the batter leaves tough bits even when baked. Oh wow!!! I’ll have to check if they have the cashew butter available here. Hi Marketman – I am an American, living in Davao. For about 18 months, I have been studying Bisaya. In my Bisaya lesson, the word that I have been taught for “cake” is indeed Keyk, and with that spelling. Vinegar (citric acid) reacts with the baking soda to produce the carbon dioxide for the chemical leavening needed to raise this very heavy dough. It has similar function as cream of tartar in similar recipes but is faster and more powerful (NV of 131 viz 112). The reaction is also helped by water and heat. Note that MM mixed vinegar with other liquids before adding to dry ingredients (with baking soda) to delay this reaction; if vinegar is mixed directly with baking soda and let to stand; your keyk will hardly rise. In contrast, baking powder has the baking soda pre-blended with the acid, mainly sodium aluminum sulfate (or SAS for Calumet) or sodium acid pyrophosphate (claimed as organic in U.S.) in a balanced way. Rate of reaction for SAS is lower (16-18% CO2 in eight minutes with water and mixing) so more recommended for lighter batters like sponge cake. baking lessons, science lessons, tunay na tagalog lessons – what i have learned this sunday morning!! thank you all – such joy to start the day with! 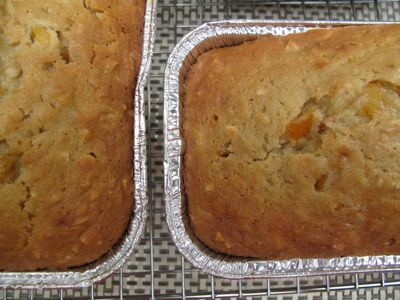 MM, banana pecan bread keyk (or kik haha) is one of my favorite things to bake, so I’m going to try adding dried mangos next time – in fact, I think I have everything in my pantry right now so off I go! what an interesting twist to banana cake. my question is, will using salted cashews change the final product? Hi there — I’ve been using a variation of your basic recipe (culled from a treasured back issue of a cooking magazine) and tweaked it with mangoes too. I used lemon juice to make “buttermilk” and mango puree instead of mashed bananas. Wagi. But the mango taste in the base cake was fleeting — overpowered by the taste of cashews. Your banana base is bound to make the mango bits shine more — i’m going to try this. Salamat! I’ve also tried this with grated apples in place of bananas and larger apple chunks mixed in with pecans. It was good when it was warm but again — the base cake taste was fleeting. The best combo was to blend in melted chocolate into half the batter and then “marble” it with the regular half. And for some reason — banana cakes taste better when it’s a day old. Thanks bemarvin for those explanations!! I once made a batch of banana cakes last Christmas and I guess my mind was preoccupied and used baking powder instead of the baking soda. I was aghast when I realized this but it was too late. My bunso right away got his laptop and googled baking soda. He told me to just go on as it may still yield the same result. Indeed,while the baking soda gives the best result,it still came out okay. Hahaha..after that I made big tags on my baking soda and baking powder as they were in identical see through containers. It’s great to have people like you explaining those things. I’ve done so many things to my banana cake recipe and now enjoy your explanation. MM,I’ve also done so many variations to your FFTG and these explanations will help further. Marami pong salamat bemarvin!! This looks good, MM! Will try! Thanks!! Your cake looks good MM, thanks for sharing. Bemarvin, my friends and I have always wondered – what is the difference between baking powder and baking soda? Would appreciate your reply :-) Thanks!! Chris and andykamatis, you guys are too funny! I grew up speaking Tagalog and still speak it proficiently, though I was still in high school the last time I spoke the way you two wrote. Used to be that when I spoke, I would think in Tagalog and then mentally translate it into English. Now, it’s the other way around. Interesting looking cake, MM. Thanks for the info, bemarvin. andy, hehehe… mahahaba talaga ang mga salitang pilipino, pero di naman mahirap baybayin, dahil kung anong tunog ang iyong narinig, siya rin ang katumbas na titik. hi tina! baking powder and baking soda are both chemical leaveners as opposed to yeast, an organic leavener.the baking soda, usually used in cookies is an alkaline that reacts with acid like vinegar and molasses. when the two are combined, there’s a bubbling and thickening effect of the dough. this is illustrated in a simple kiddie experiment – pour vinegar on baking soda and there’s a sort of “explosion.” The explosion is the leavening action taking place.On the other hand, baking powder is a neutral compound created by the mixture of baking soda (an alkaline) and acid. double-acting baking powder reacts at room temperature with moisture, and again in the oven in the presence of heat. it gives the extra lift for a light and airy cake. Tina,because of my boo-boo last Christmas,I found out that you can make baking powder by using one part baking soda to two parts cream of tartar. I accidentally placed baking powder instead of baking soda into a big batch of banana cakes mix. My son googled it and that is what I learned. From mistakes come new found knowledge. Am I right bemarvin? Anyway,you can google it. Hahaha…that’s what my son did when he saw me groaning at what I did. The banana cake came out okay as well. That’s a good explanation of the difference between baking powder and baking soda… to think I used it once or twice interchangeably when I run out of the other. Now I know… Thanks! Hi Tina, sorry I was out all day. Chris did answer your query and I gave an earlier post on 15Feb (third paragraph). In general, chemical leavening is baking soda (sodium bicarbonate) + a food acid to produce carbon dioxide, a salt, and water (in presence of water and heat). There are at least 20 food acids including common ones like vinegar, lemon, cream of tartar (becomes tartaric acid with water). So, when you are using baking soda and an acid in your recipe, you are actually making up baking powder from scratch. For ease of use, commercial baking powder is a pre-blend of baking soda and a food acid commonly sodium aluminum sulfate (SAS) in the U.S. and sodium acid pyrophosphate (SAPP) in Europe (where SAS is banned). Most home bakers in the US learned with SAS (+MCP, another food acid, for early double-action) because of popular Calumet. In industry, the choice of the right food acid is dictated by product or process requirements (Taiwan has at least seven kinds of baking powder). For example, if you are making 1,000 pcs Hongkong-style siopao (with the crack on top of bun), you need a slow acid like SAPP15 so you will have enough time to fill the buns. On the other hand, for 1,000 cake doughnuts, you need a fast acid like SAPP40 because you need the volume to rise before the boiling oil (180C-220C) sets the starch in the flour. At home with small volume, the attentive chef can control by powder dosage; in industry, where bakery operators are sometimes not expert, you need the right functional ingredients to avoid quality issues. The exact proportion of food acid viz sodium bicarbonate is determined by that acid’s neutralizing value (NV). MM’s banana keyk had the right ingredients for heavy dough and the right chef, so the ‘umbok’ is perfect and you can also imagine, from the slice picture, that the keyk would be soft and fluffy because of that same ‘umbok’or alsa. P.S. There are four common dough-raising process: (a) yeast fermentation, (b)chemical leavening as above, (c) by heat say biscuits, and (d) water evaporation (with butter) say sheeted products like croissants. And all with each own complex reactions. Marketman…thank you for being so generous with your time and the blog to help us struggling cook. And Betty Q thank you for all the hints and help you offered to everyone who asked for your help. May I be a receipient of your award winning chocolate cake since I need to bake something for our group who are losing our jobs soon. May be the cake will ease the pain and worry we are now having. My e-mail is albeniaj1@aim.com…. Keep up the good work marketman and thanks for letting me know to watch Anthony Bourdain’s show tonite. I thought the reason why you add vinegar to the milk is to thicken the milk since acid reacts with the milk fat. it’s a substitute way of making “buttermilk” since it’s not available locally. I use sour cream most of the time or yoghurt instead of the milk with vinegar. Works well. Anybody has a recipe of mango bar? The food acid in sour cream is lactic acid which has similar NV as SAS. It has the added benefit of imparting creamy notes because from milk and typically used for gingerbread recipes. bemarvin, why is SAS banned in Europe? Hi Angela, this is a complicated story which I personally believe is just the usual trade wars between European and American food standards and businesses being fought, by proxy, in the our side of the world. Obviously, the US FDA does not agree with this bad effect – at low dosage, etc. – and would have scientific studies to show such. The FDA allows the use of SAS in America with ingredient labeling. This approach is consistently American and democratic and are noticeable with other ingredients. The European food authorities, on the other hand, generally take a Big Brother approach, briefly, that if an ingredient that is added by human action to food with (1) even just a suspicion of detrimental effect, and (2) there is a feasible substitute (the pyrophosphates), then the Europeans will ban that suspicious substance. The safety record shows that both approaches are correct and are more determined by what their respective publics value. I have a personal story to tell here. About ten years ago, the Eqisa salesman from Texas (their biggest SAS mine is in Mexico) tried to sell me SAS on the strength that Calumet (and Kraft – a very reputable firm was using it). In the technical package was a data sheet telling that the health claim against aluminum is false. Fast forward around five years, Eqisa was bought by Budenheim, the giant German phosphate company producing SAPP, in effect getting control of the global chemical leavening market. Thereafter, the controversy stopped from resonating though the food standard, I believe still stands. Anyway, I ended up using SAPP in development not because of the safety issue – I had the FDA behind me if I chose SAS – but because SAPP would have provided more flexibility (and cost savings) to my target industrial market. The cost itself was no issue at that time as it was pegged to the relative NV value. Postscript: my strategy did not work to even dent the leader. Most of us grew up on Calumet and developed our recipes with it. And very few were willing to accept the switching cost of new research to make sure SAPP would not change taste (#! ), etc. and affect their business. MM, I apologize for the length and in adjacent world of industry. You and the rest have moved on and Angela did take time to ask a direct question. Tnx. bemarvin, there’s a lemon cake recipe I have been tinkering with and need some advice. I don’t think this is the forum to ask, so do you mind if I email you? We can use this site, too, as long as it is okay with MM. bemarvin, that is very interesting! True, we grew up on Calumet. This is the only brand I see in Manila. I really hope we have more choices that are of good quality. So, would you say that baking powder would make the cake more fluffy than baking soda? I seem to remember some recipes calling for both. I also hope that yeast can be more available in small packets because I can’t finish the big one being a home baker. It dies (even if I put it in air tight container in the fridge) so it comes out expensive. Is anybody familiar with the flour that Bea of Latartinegourmande uses? Amaranth, quinoa, almond flour. They sound more healthy because they are gluten free? Hi Angela, appreciate the confidence but I am nobody as recipe development person (the MM community has great ones among them); I am more an ingredients and processing guy. If you do need help in these two latter areas, I do not mind to assist; we do need to find a way to exchange email details. Hi Corrine, Calumet is a great easy-to-use product for home baking. 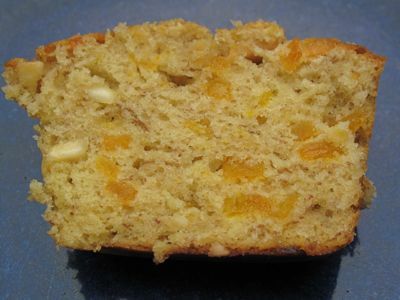 When you have the right dosage for the type of cake (for example, pound cake should be different from sponge though the knowledgeable will go scratch through the stronger soda-acid way), the most impact on volume will come from mixing time and technique. In fact, you can compensate to some extent for weak ingredients with right mixing. The best way to learn this is to let an expert show you and then practice ’til you have a feel for when mixing is done rather than to just follow the time given in the recipe. Gluten is a protein so – unless you have a specific allergy to it – It ought not to be unhealthy to eat it. Its function in bread is to provide the balloon-like cells which gas from yeast fermentation blow up to provide ‘alsa’. It also has a role in the characteristic bite and chewability of bread. So taking it out is a beast of a problem. We have tried to replace the gluten function with different combinations of modified starch and gum while boosting gas production from yeast with baking powder but still got a loaf that is closer to ‘puto’ than bread. Still a lot of work to do. BTW, I LOVE Beatrice’s website. She takes beautiful pictures! I’ve been visiting her site for about 8 months. You can email me your addy there if you are not comfortable leaving it on this site. Corrine…the reason those kind of flours are available is mainly for people who cannot tolerate the gluten found in wheat. Some people have absorption problems in their gut that if they ingest gluten , their body reacts. ..it is called celiac disease or syndrome. it is not so much an allergy but more of absorption problems. Am I right on the money, Doc C. and San? As bemarvin have said…gluten is the building block. If yoou sub it with rice flour for instance, you will not have the proper structure of a baked product that identifies that particular product. I can see it being used in cookies if you want healthy cookies! Thanks bettyq! Now, I won’t feel guilty about using ordinary flour.